I apologize for the way the original message came across, or didn't. As they say in the Field Artillery when a round goes astray "It looked good when it left here". Here it is. If you cannot or do not want to open it here is a description of the picture and article found in today's Arizona Republic on the front of the B Section. I do use Norton Anti-Virus to scan all out going emails and well as incoming. The picture took up almost one third of the page. The picture is of a man by the name of Carlos Sanchez who supposedly was there to avail him self of the illegal job center. Draw your own conclusions. The expression on his face, a close up, is what I would call the "Hood Attitude, you owe me everything". 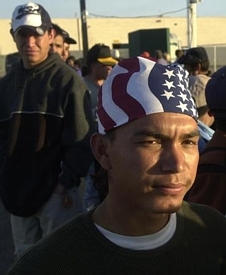 On his head is an American Flag tied as a dupey rag (not sure of the spelling) hat, the type of head covering worn by cleaning people as portrayed in movies. The message is clear to me from the expression and the flag and that fact that he is in an area that the I.N.S. has declared a safe area. In an area the City of Phoenix has told him he is protected in. Why wouldn't he display disdain, disrespect and contempt for America, he is protected. If you or I were to wear a Mexican flag or a flag of any Central or South American country in such a fashion we would be lynched by the race vigilantes. The article was intended to congratulate the City of Phoenix for opening its first center for illegal aliens to make a connection with cash paying employers. It cost the city $120,000. It will be operated by a number of what are referred to as non-profit organizations such as Chicanos Por La Causa and Friendly House In this case non-profit should not be confused with no public funding. All of the organizations operating this have received funds from the City of Phoenix and Maricopa Country in the past. I intend to notify the Mayor of the City of Phoenix that I will suggest to every citizen of Cochise County that I can, that they should file a claim against the City for the damage and destruction caused by these people on their travels north. If enough people file the claims and are turned down there may be sufficient numbers to bring a class action suit. In my opinion the City of Phoenix should not be entitled to fly the American Flag on any of its buildings as that is as great a desecration of the flag as the individual pictured. Day laborer Carlos Sanchez waits Saturday for possible work at the new Macehualli Day Work Center at 25th Street and Bell Road. The center is intended to minimize the safety and health hazards temporary workers encounter. Finding work on the streets is still a tough way to make a living, but now at least it's safer for day laborers in north Phoenix. The city-sponsored Macehualli Day Work Center opened Saturday near 25th Street and Bell Road. About 40 prospective workers showed up for the 5 a.m. opening. Day laborer centers are used nationwide to give workers and employers a safe place to negotiate work terms and to satisfy business owners and residents who complain of workers hanging out on the streets. Luz Sarmina-Gutierrez, president of non-profit Valle del Sol, said the project was designed to minimize the safety and health hazards temporary workers encounter daily. "It's a risky thing for them, to be on the street and get in the car with someone," Sarmina-Gutierrez said. "The center is a safe place for employers and workers to connect." The $120,000 center is a gated, outdoor meeting place with shade and tables. A circular drive serves as a pickup area. Center staff operates the facility from 5 a.m. to 2 p.m. Monday through Saturday. Laborers cast their names into a lottery to determine who's first to work. Part of the safety angle is a tracking system where laborers log how many hours they worked and for whom. Organizer Salvador Reza said lack of regulation has led to worker exploitation. "There's cases where people have gotten run over, where they get picked up on the street and you don't know who they go with," Reza said. "Sometimes they'll only get $20 for 10 days of work." That is, if they find work at all. Efrien Rosales, 32, left Chiapas, Mexico, to find work in the United States over three weeks ago. Every day, he competes for temporary employment with dozens of other day laborers. "There's so many workers and no organization," he said. "Sometimes, it's not about how many jobs there are, but about who gets there first." Rosales said he came to Arizona to better his life and provide for his wife and two children, who remain in Chiapas. A privately funded day labor center is scheduled to open in Chandler on Feb. 17 behind Iglesia Metodista Libra at Arizona Avenue and Saragosa Street. The church raised $40,000 toward building the center, and private contributions came from grocer Eddie Basha and members of the East Valley Bible Church. Although the Phoenix center was built with taxpayer funds, daily operation costs are privately funded. Non-profit agencies Chicanos Por La Causa, Friendly House, Valle del Sol and Tonatierra each provided $5,000 toward operations for 2003. The four agencies and Phoenix formed a coalition for the center's site selection and development plans. It's a tight budget, especially with three full-time workers, Reza said. Center organizers will conduct fund-raisers and seek private donations for the 2004 budget. Reporter Edythe Jensen contributed to this article.